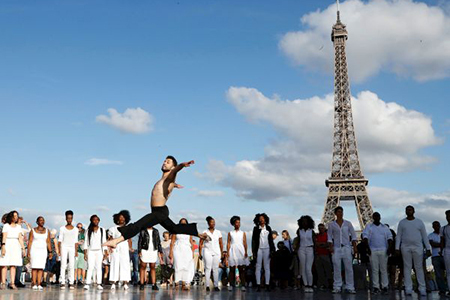 From Palmyra to Paris: "Syrian Billy Elliot" Ahmad Joudeh is set on showing the real image of his nation and erasing the horrors of the Islamic state group. Joudeh was invited to Paris by singer Sanga, his friend and admirer, for a special one-off performance, using a song specially written for him. Thursday's show at the Eiffel Tower was the first in what he hopes will be a series of collaborations, said the 27-year-old, savouring his first visit to the French capital. "Actually I am trying my best to show the real image of the young Syrian people and not the fake one" projected by the Islamic State group, he explains in polished English over a beer. Joudeh has come a long way from his childhood as a Palestinian refugee growing up in a camp in Yarmuk, Syria. 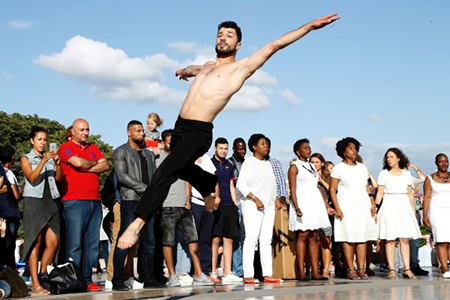 The story of Joudeh, who like the boy dancer in the 2000 Stephen Daldry film "Billy Elliot" realised his dream of becoming a dancer against the odds, is already well known far from his war-torn home. He had his first break in 2014 in a television talent show "So you think you can Dance?" for young hopefuls from the Arab world. His profile rose further when, two years later, he was the subject of a Dutch television report that has clocked up millions of hits online: "Dance or Die". He has had those words tattooed in Sanskrit onto his neck, and they carry a special weight for him. Footage of him dancing in the ancient Syrian city of Palmyra appears to have enraged the Islamic State group so much that they have threatened to kill him. The sight of him dancing in the ruins of the Roman city the Islamists captured and sacked -- beheading, among others, the city's 82-year-old former head of antiquities -- was apparently too much for them. But the tale Joudeh told in the Dutch documentary, against a soundtrack of nearby gunfire and intercut with scenes of him dancing on rooftops, touched hearts around the world. 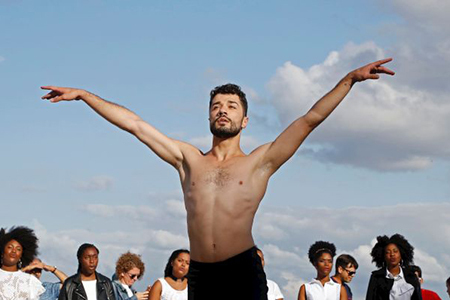 "Dance changed my life to get me from all the bad situations around me," he explained. 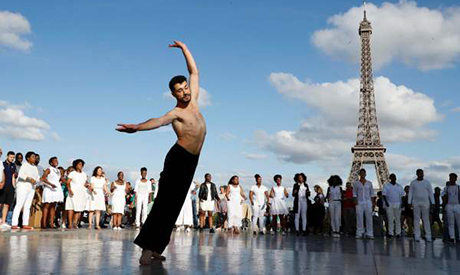 "Even in Syria, I danced to feel free from all the chaos and destruction around me. I felt I was in a big jail." He was surrounded by the conflict, but as a refugee and a stateless citizen there seemed to be no way out. Even as a child he had to fight to pursue his dream, not least against the opposition of his own father, who could not accept his chosen path. But for him, dance was the solution, not the problem. "When I dance, if I'm sad, I get it out. If I'm happy, I get it out." "They call me the Syrian Billy Elliot," he added. 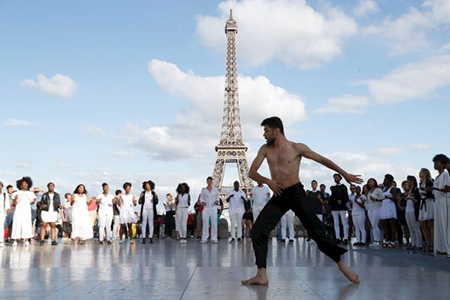 He trained for years with the main dance company in Syria at the Higher Institute for Dramatic Arts in Damascus. In his spare time, he gave dancing lessons to children. And he pursued his dream despite the war and the loss of loved ones. Each personal drama, each tragedy only fuelled his art, he said. It was the documentary that led to the Dutch National Ballet inviting him over to join their company. While it was a wonderful opportunity, it has been difficult to adjust to life there knowing that his family was still back in Syria enduring very different conditions -- especially his mother, with whom he lived until his departure for the Netherlands. He has been training hard to catch up for the lost time during the conflict in Syria. But nine months after his arrival there, he says: "I feel guilty for being happy." But he also dreams of returning to Syria to help the people there, much as the actor Angelina Jolie has done, someone he admires for her humanitarian work. And one day, he said: "I will go back to Syria to create the Syrian national ballet." Because Syria needs art, not guns and conflict.